Ingredients DOUGH: - 2 cups sugar - 2 1/2 sticks softened butter - 2 eggs - 3 cups flour TOPPING: Egg wash (one egg, 1 tsp of water, whisked together) - Cinnamon - Ground almonds - Holiday sprinkles Steps - Preheat oven to 350 degrees. - Work together sugar and butter. - Slowly add beaten eggs until mixed. - Slowly mix in flour. - Separate into four sections. Refrigerate in wax paper for at least three hours. - With a rolling pin, roll each section to one-eighth inch on a well-floured board. 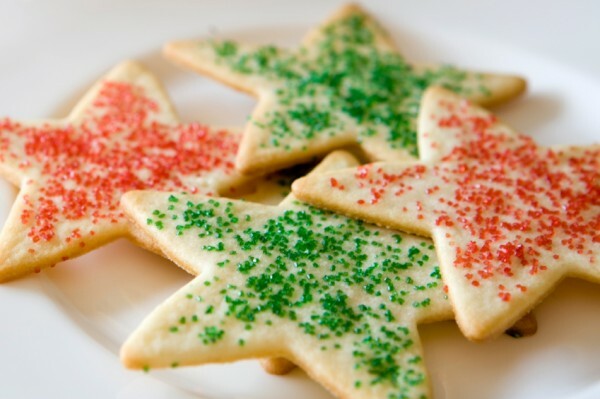 (it helps if the dough is as cold as possible) - Using festive holiday cutter, cut cookies and place on a parchment-lined cookie sheet about one inch apart. - Brush each cookie with beaten egg wash. - Sprinkle each cookie lightly with any combination of ground almonds, cinnamon, or sprinkles (your call). - Bake at 350 degrees for eight minutes. The cookies will be slightly browned on the bottom when done. - Cool on rack. Makes around 70 cookies.